I first experienced Rudd’s Sauvignon Blanc at the Grand Opening Party at Calistoga Ranch’s Resort in the upper Napa Valley. I fell in love with the vibrant and elegantly smooth finish that is full of citrus flavors and a hint of vanilla. 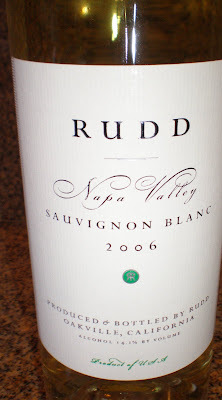 Rudd is best known for their Cabernet Sauvignon but has been quietly producing some of the best Sauvignon Blanc. Robert Parker rated this wine “Outstanding 93 points”. Other flavors include: notes of guava, fig, honeysuckle and honeydew melon.